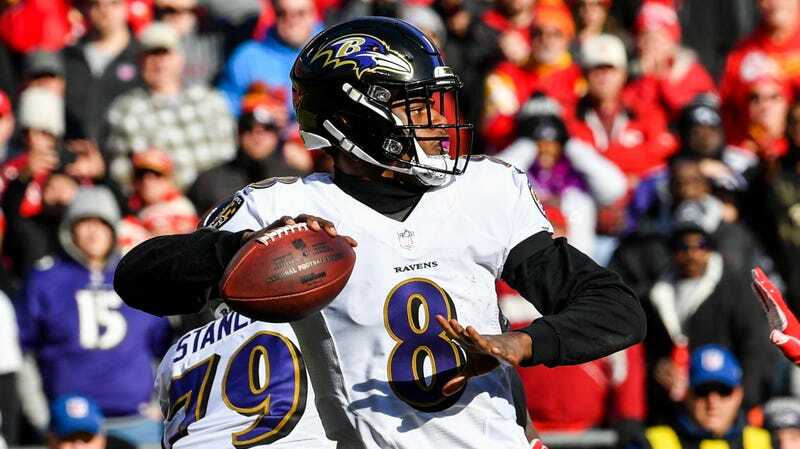 Rookie quarterback Lamar Jackson has started the last four games for the Baltimore Ravens while starter Joe Flacco has been injured, and in that span of time he’s helped resuscitate Baltimore’s playoff hopes. Jackson’s gone 3-1 as a starter, and the Ravens are now creeping up on the Steelers for the AFC North title. Today, head coach John Harbaugh rewarded Jackson’s performances by announcing that he will start this week’s game, even though Flacco is healthy and ready to play. Throwing a franchise quarterback who won you a Super Bowl into the dustbin is no small thing, but this is obviously the right decision. The Ravens were 4-5 with Flacco as the starter this year, and were riding a three-game losing streak before he got hurt. They had to completely retool the offense in order to adapt to Jackson’s skill set, and at this point abandoning the new system, which has produced good results—it’s amazing what can happen when a coach is smart enough to shape his system around his players rather than the other way around—out of loyalty to Flacco would be unwise. More importantly, this keeps the Ravens fun. Jackson, a Heisman winner who dipshit Football Knowers around the world were insisting needed to be converted to wide receiver when he was drafted, has been as good as anyone could have hoped. He’s scored seven total touchdowns, has run the ball for at least 70 yards in every game he’s played, and last week just about pulled off a huge upset over the Chiefs. The Ravens will remain fun to watch up until the point Jackson inevitably breaks his leg in the first quarter of a playoff game.